Microsoft said Wednesday that it planned to release an “enterprise feature pack” for corporations who wish to adopt Windows Phone, while extending the support lifecycle for Windows Phone 8 to 36 months, through 2016. The new feature pack includes VPN functionality that will automatically trigger when protected resources are accessed, Microsoft said, plus S/MIME to sign and encrypt email and EAP-TLS enterprise Wi-Fi support. The pack will be released in the first half of 2014, Microsoft said in a blog post on Wednesday. The real question, however, is whether Microsoft’s carrier partners will allow the feature pack to be pushed to their customer’s phones—or, at least, that was what virtually every commenter on Microsoft’s post had in mind. Carriers typically review, test, and deploy new OS upgrades over a matter of months, with no guarantee that updates will actually be pushed to consumers. You could be seeing this screen in a corporate environment if Microsoft has its way. 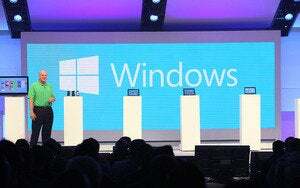 Nevertheless, some users were doubtful that they’d ever see what Microsoft promised. “This is all excellent news, and I can’t wait for this to be available... but how will this feature pack be released?” a commenter named “GoodThings2Life” wrote. “Will we continue to be at the mercy of carriers and OEMs to publish this in a timely manner, or will it be available as a store app or customer-installable or enterprise-pushable update?